Clove Wine Sorbet is a wonderful palate cleanser that is not too sweet to interfere with the wines you are serving with your meal! Clove Wine Sorbet is crisp, refreshing, and ridiculously tasty. Because you strain out the cloves from the syrup, you get a light subtle hint of cloves in this sorbet which is not overwhelming yet gives it a holiday feeling. So unusual and so delightful, plus makes a great holiday palate cleanser or dessert. Serve this delicious sorbet at your next dinner party. Make this Clove Wine Sorbet ahead of time and keep in the freezer until ready to serve. More great Ice Cream, Sorbet, Granita, and Gelato Recipes. In a medium saucepan over medium heat, combine sugar and water. Stir until mixture comes to a boil; reduce heat to low, add cloves, and simmer 5 minutes. Remove from heat and cool completely. When cool, strain and discard cloves. Add wine and lemon juice to the sugar syrup; stir until thoroughly blended. The wine (or any other type of alcohol) is the secret to a soft sorbet. Alcohol itself does not freeze and adding a little bit keeps the sorbet from doing the same. Ice Cream Maker - Transfer mixture to ice cream maker, process according to manufacturer's instructions. Freezer Method - Pour into container, cover, and place mixture in the freezer. When it is semi-solid, mash it up with a fork and refreeze again. When frozen, place in a food processor or blender and process until smooth. Cover and refreeze until serving time. Can be prepared 3 days in advance. Cover and keep frozen. Makes 10 to 12 servings. 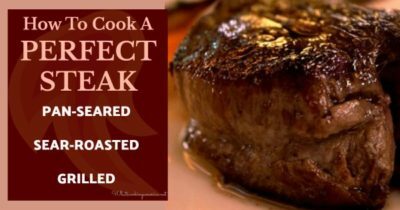 Learn how to cook perfect steak every time! A complete resource guide on purchasing, cooking methods, types of beef steaks and favorite steak recipes.